Book of abstracts, educational videos and presentations on the latest findings and research accomplishments on Xylella fastidiosa are now available on the websites of EFSA (European Food Safety Authority) and the Department of Agriculture and Water resources of the Australian Government. 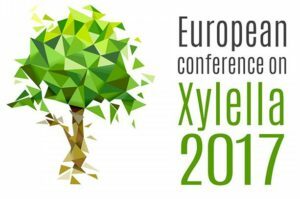 More than 100 contributions by major experts on the research on Xylella were presented during the 3 days conference in Palma de Mallorca (Spain). An article about the conference has been published on EFSA website: Xylella: ‘Impressive progress, but much still to be done’. 1.115 unique viewers watched the live streaming over the three days and the smartphone app was downloaded by over 300 users, with a lively exchange of messages among participants and over 80% of participants that recommend the use of similar event tech for future conferences. 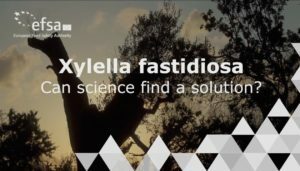 Two informative videos on Xylella fastidiosa have been published by EFSA (European Food Safety Authority). “Xylella fastidiosa: Can science find a solution?” provides a general presentation of the impact of the bacterium in olive trees in Southern Italy and the description of the main ongoing research programs. “Xylella Tutorial | How to collect data on Philaenus spumarius (spittlebug)” is a tutorial video with a brief step-by-step guide on how to monitor the presence and occurrence of Philaenus spumarius (spittlebug), the vector of the bacterium in Southern Italy. 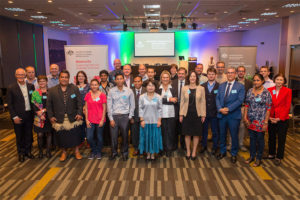 In May 2017, the department of Agriculture and Water resources of the Australian Government hosted an International Symposium on Xylella fastidiosa in Brisbane, Australia. The symposium had seen the participation of 102 international delegates and speakers coming from all over the world, with the participation of many researchers involved in the XF-ACTORS and POnTE H2020 projects (i.e. Professor Alexander Purcell, Professor Rodrigo Almeida, Dr. Marie-Agnès Jacques, Dr. Anna Maria D’Onghia, Dr. Donato Boscia, Dr. Baldissera Giovani).